MYKONOS where have you been all my life??? Wow it’s been a while! July was a crazy month! My hubby and I celebrated our 5 year wedding anniversary and went on a fabulous trip to Greece. Honestly, I don’t even know where to begin because it was truly the most amazing trip we have ever taken. We went to Athens, Mykonos, and Santorini. Our trip was definitely the trip of a lifetime. We were very lucky that our friends were in Greece at the same time and gave us a VIP experience. I think I am going to have to split this up into a few posts because we did so much and I want to tell you all about it! Our fist stop was Athens for a day and a half before we left for Mykonos. 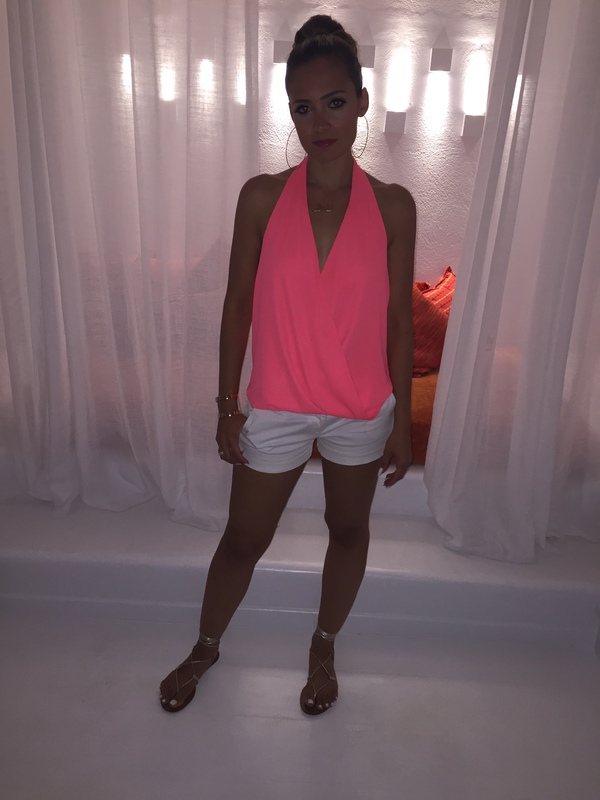 I have always heard wonderful things about Mykonos and was so excited to experience it especially because we were there with friends. Now I have been to a lot of crazy places in my life in Europe and in the US., but let me tell you, Mykonos is a different world! The beach parties are out of control, the food is beyond words, the music, the restaurants, the shopping, the nightlife is all best of the best, and the atmosphere is perfection! The Greeks have their party schedule down. In Vegas, the problem is that the day parties are amazing, but the last time we went, we all fell asleep after Drai’s and woke up at 11 p.m. and at that point it was too late to get ready to go back out. 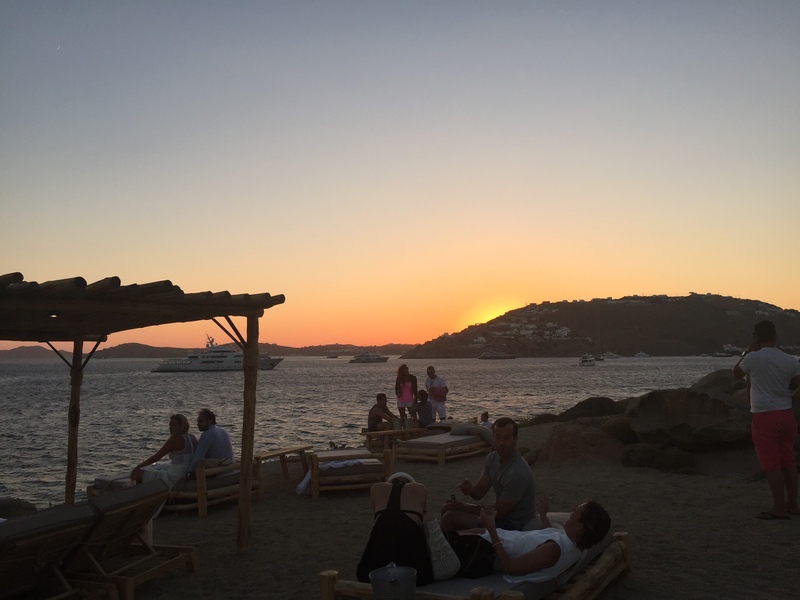 In Mykonos, everyone goes to dinner around 1 a.m, and then the night begins. You sleep on the beach the next day until you do it all over again because the beach parties don’t start until around 7 p.m..
Make sure to bring a lot of flats with you because the roads are really bad so at night, unless you want to break your legs, most girls wear sandals. I hated the idea at first because I practically live in my heels, but I have to say I have never been more comfortable in my life. It is such a good feeling when at the end of the night you are still dancing and your feet don’t feel like you are walking on nails. Also, there are no taxis (they have about 25 on the entire island) so be prepared to walk home unless you have super amazing friends that will drive you home. If all else fails you can rent a car, a 4-wheeler, or a scooter if you want to brave the mountainous roads. They are especially fun if you are going home at 5 a.m. along with everyone else who has been out all night. 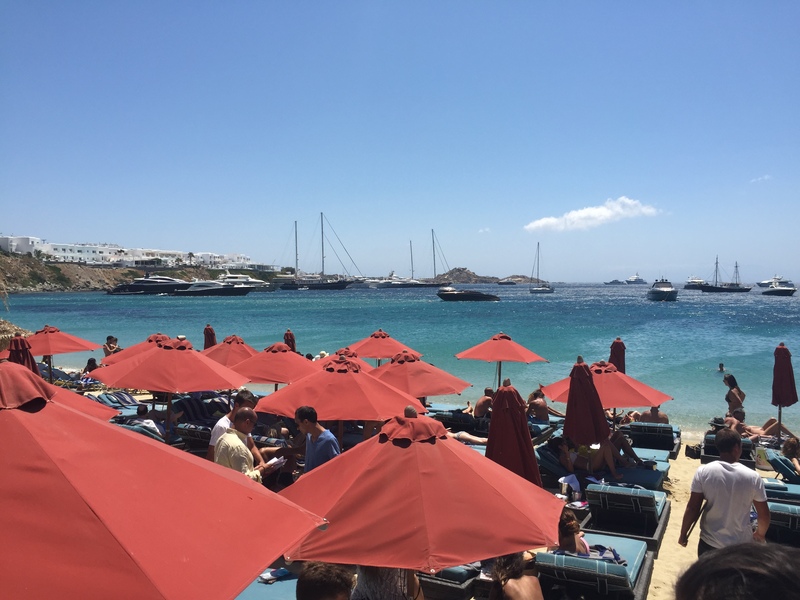 We were lucky that our friends recommended we find a hotel in Mykonos Town or close to it, which we did. We stayed at the luxurious, Ostraco Suites, too bad we didn’t spend very much time at the hotel because we were out most of the time. We never even made it to the breakfast they have by the pool every morning. The island is absolutely beautiful and the views are spectacular. It feels very surreal when you are at a beach party overlooking the Aegean sea and mountains with the sunset in the background. If you visit Mykonos and don’t go to Nammos you didn’t really go to Mykonos!